Bovada is a North American sports book that has been in operation since 2007. Bovada not only offers odds on all major sporting events, it also provides horse racing, casino games and poker gambling. The company is fully licensed by the Kanawake Gaming Commission and operates in Mohawk Territory in Canada. In this review we will look at Bovada’s sports book operation in detail to help bettors decide whether or not they should open an account. As might be expected from a North American sports bookmaking operation Bovada specializes in MLB Baseball, NBA Basketball and NFL Football. Bovada is also particularly strong on UFC and MMA events. In addition to these sports, Bovada also offers betting lines on Hockey, Soccer, Tennis, Golf, Boxing, Motor Sports, Rugby League, Rugby Union, Cricket, Darts, Snooker, Horse Racing and Entertainment. They have strongly positioned themselves as one of the leading book makers for soccer, offering money line, point spreads and total bets on soccer games. They are also offering parlay and prop bets. Bovada has a number of promotional offers and bonuses available for its sports betting customers. New sports book customers at Bovada may be eligible for a 50% welcome bonus. This bonus gives a free bet of up to 50% on the initial amount deposited at Bovada. For example, if a deposit of $200 was made at Bovada, the bonus free bet amount would be $100. The maximum free bet bonus is $100. Please see the Bovada Sportsbook site to check the current offer as they may change. Bovada has also been known to offer bonuses for inviting your friends to play along with you, this may not always be the case so check the site to see! Bovada has live betting available. This allows you to bet on games at they are in play. As the game progresses the odds change. This can add an additional element of excitement to watching the game. It also enables you to change your position on a game as it changes. Bovada offers mobile betting which allows you to place bets using your smart phone. 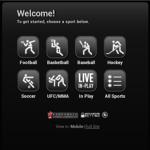 The Bovada mobile platform is fee to use and odes not require you to download any software. Bovada mobile sports book works with iPhone 3 and higher and Android. Mobile betting at Bovada offers betting lines on all major sports events. Using Bovada’s mobile betting platform bettors can also place parlays, teasers and propositions betters. There are also live and in-play betting available. Bovada provides some of the best deposit options available for American players. Bovada provides betting options for Visa debit, credit, prepaid and gift cards. The minimum amount you can deposit using Visa is $20 and the maximum is $1000. There is a 4.9% charge on deposits made using Visa but the initial deposit is free. Bovada offers wire transfer deposits. The minimum deposit is $100 and the maximum is $5000. You are able to make up to two wire transfer deposits each month. Another deposit option is Moneygram. This is similar to Western Union. One nice feature of using Moneygram is that Bovada will waive the transfer fees on deposits of $300 or higher. The minimum amount you can deposit at Bovada is $100 and the maximum amount is $900. You cannot make more than one Moneygram deposit per week. Most recently they’ve introduced Bitcoin as a deposit method and you can deposit between $20 and $5000 using this method. There are no fees on Bitcoin deposits. If you are looking for a well regulated and professional sports bookmaking operation to place your bets with then Bovada may be an excellent option. The company has been in operation for quite some time and over that period has won a reputation for excellent customer service and very competitive odds. In particular bettors who enjoy placing bets on MLB, NBA, NFL and UFC should look at opening an account with Bovada. The bonuses on offer, specifically the refer-a-friend and welcome bonus, are significantly more generous than many of their competitors. Overall Bovada is an excellent choice for most sports bettors.